Madden Feast is here! Learn all about it below. Welcome to Madden Feast! The Madden Feast program will give you the opportunity to invite well known players, from past and present NFL Thanksgiving Day games, to Thanksgiving dinner! 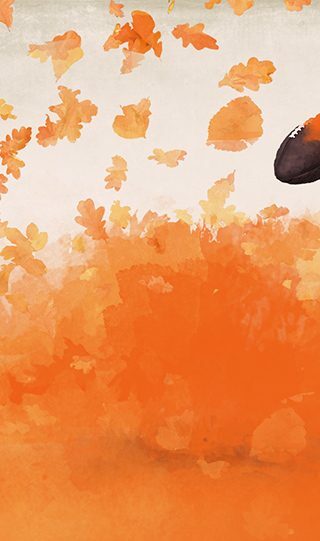 There will be three currencies during the program: Madden Market Tokens, Thanksgiving Food, and Shards. During the program you need to gather Thanksgiving Food to invite and power up the Madden Feast Masters. You will need to use Madden Market Tokens to play the events that award various food items that all exchange for Thanksgiving Food. Madden Market Tokens are the equivalent of Blitz tokens for this program. Unlocking and powering up Thanksgiving Masters will award you items called Madden Pies that you will be able to use to unlock and upgrade the Grand Master Calvin Johnson! Playing events with your Madden Market Tokens will reward various types of Thanksgiving Food items. There are 17 different food items and all of them can be exchanged for varying amounts of Thanksgiving Food. Each Master will require you to collect and then exchange a specific amount of each type of food item, in addition to acquiring a requisite amount of Thanksgiving Food. Once you have acquired a Master you will need to keep collecting and exchanging Thanksgiving Food items in order to upgrade them. Each time you acquire or upgrade a Master you will receive Madden Pies. Earning a certain amount of Madden Pies will let you acquire Master Calvin Johnson. Once you have acquired Calvin Johnson you will be able to upgrade him by collecting and spending additional Madde Pies. In total you will have the ability to upgrade 6 different players to 93 OVR. There will be Turkey Gobbler events that appear at different times throughout the program. 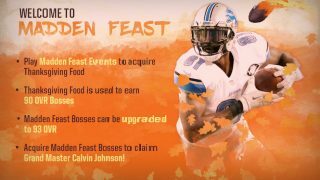 These events will offer lots of bonus Thanksgiving Food items and have a chance to reward Madden Feast players! You will need to pay attention to when things spawn and check back from time to time to take advantage of these events. On Thanksgiving Day there will be various players available from the teams that are playing on that day. You will be able to play Thanksgiving food events to collect shards to unlock these players. Additionally, there will be prediction events before the actual NFL games that day that will award Madden Cash if you predict correctly!